Ryan was on the road for my birthday last week, and to make up for celebrating alone we went to Newport for his off day! For those of you who are unfamiliar with the baseball life, Ryan gets 10 days off in 144 games. So off days are cherished and celebrated, even when there is no birthday involved. Newport is only 30 minutes from Providence and is a perfect day trip. We decided to do our own tour of the Newport Mansions and have a fancy lunch on the water to really make a day of it. 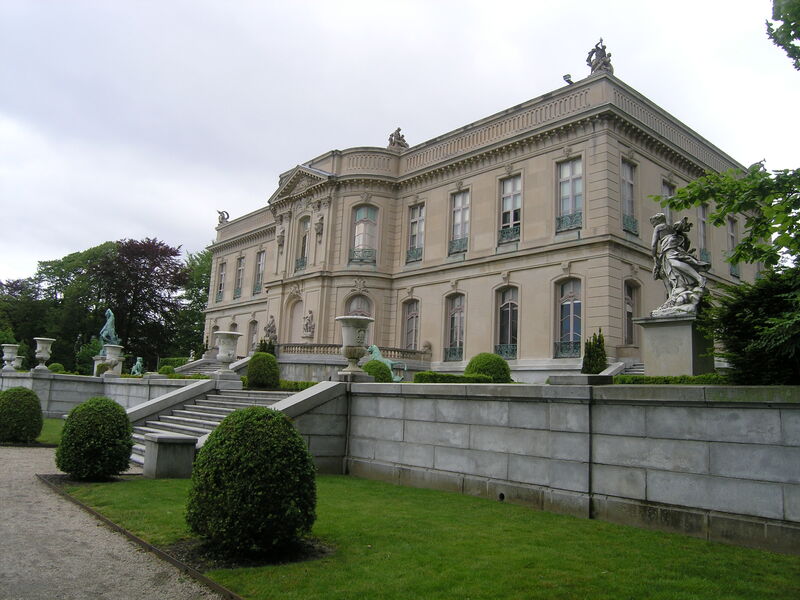 There are eleven Mansions in Newport that have over 250 years worth of history on display. The Rockefeller, Monroe, Oelrich, and Vanderbilt families all owned estates here, so you are in the presence of overwhelming wealth and prestige. For travelers, you can purchase a day pass to see any five mansions and do self-guided audio tours along the way. 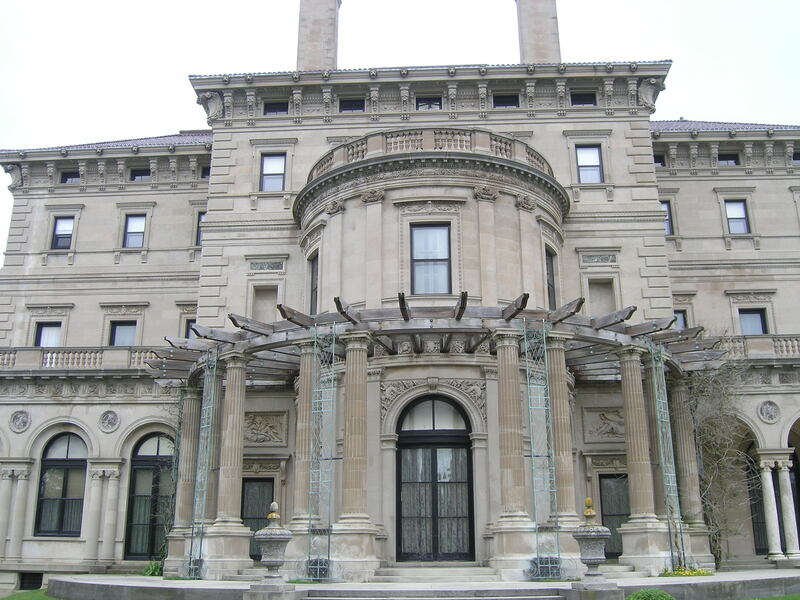 To do all five with the audio tours takes a full day, so we quickly decided on The Breakers, The Elms, Marble House, and the Rosecliff Mansions. They were all beautiful in their various ways and are vastly different based on the years they were built. One common feature we found interesting were the number of chairs in each bedroom. The beds were teeny tiny (Ryan would need three himself), but there were at least 8 chairs in each room. It kind of became a fun game to play to count them. Aside from this I especially enjoyed the kitchens; these were the days of serious entertaining. 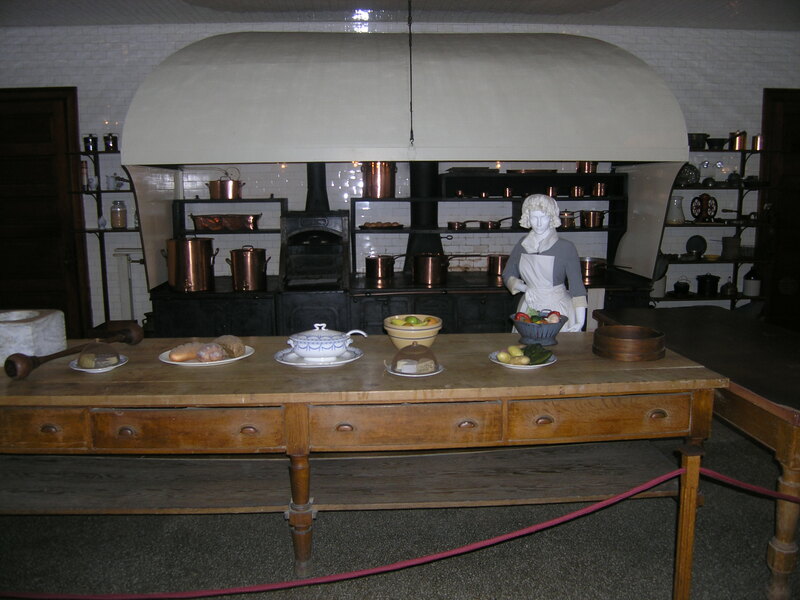 Kitchens were set up like restaurants are today: full lines for stove tops, mulitple ovens, sinks, and assembly tables. Sit down dinners for 50+ guests were normal for maintaining social status, and the dishes prove it. Each house had at least two rooms filled with china in addition to chests filled with molds, cutters, and serving platters. I was already plotting how this could be done in our dream house, to which Ryan rolled his eyes and was slightly frightened for my love of dishware. Not exactly ideal when you move 5 times a year. You are not allowed to take pictures in the mansions, but I made Ryan sneak in one. We got in trouble, but it was worth it to show you. Halfway through our mansion exploring we took a break for lunch. Since my blog is all about food, I will obviously go into great detail about our perfect lunch. We went to The Mooring restaurant on the water which is located downtown and well known for fresh seafood. We decided to order a bunch of appetizers (my favorite way to eat) in order to try a few things. We started with the seafood doughnuts- lobster, shrimp and scallops in a cornmeal batter. They are served piping hot in a paper bag with a spicy aioli. I had the perfect Spring Salad with simply tossed mixed greens, asparagus, tomatoes, and a light vinaigrette. Ryan had the clam chowder- creamy with lots and lots of clams; I loved it. For our entrees I had crab bruschetta with fresh basil, tomatoes, and caramelized onions. It was surprisingly delicious and I will definitely try to replicate it soon. Ryan had the crab cakes that I’d say were average. 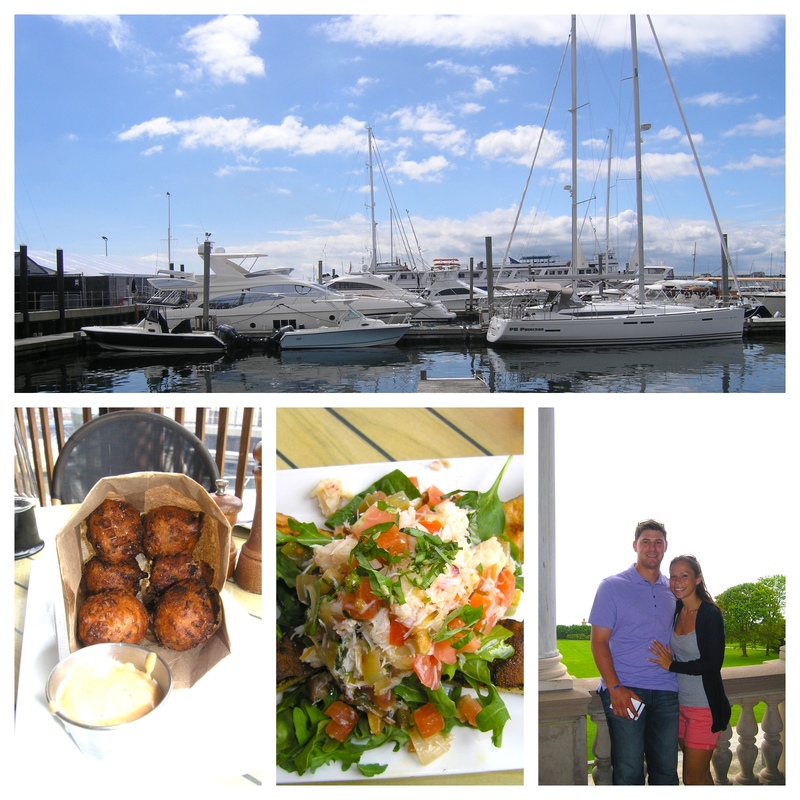 A sunny afternoon, boats on the water, and fresh seafood- it was the quintessential Newport experience. 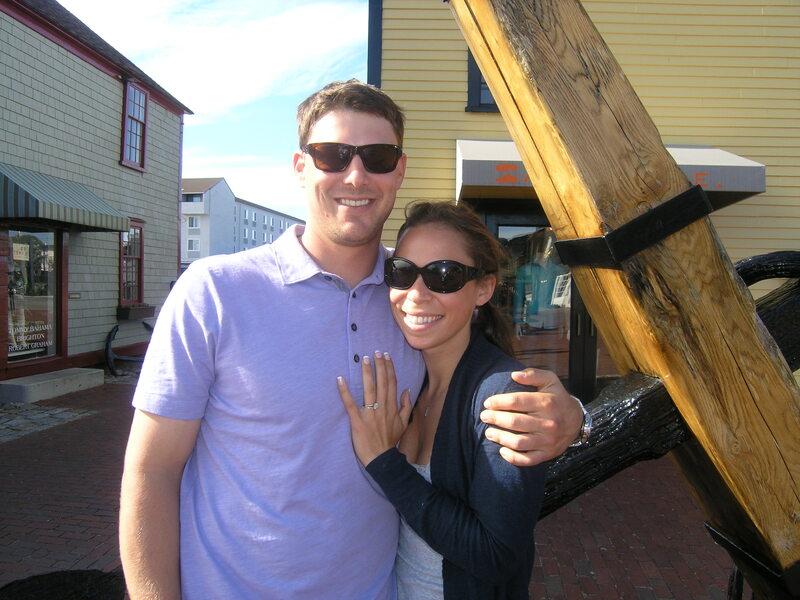 So happy for you both!!!! Thrilled and I loved reading this very special blog! P.S. The watermelon feta salad is awesome. I would have never thought to combine those ingredients and we all loved it. Light and delicious. I am so glad that you liked it! and thank you everyone for such nice comments! What a special day it was! 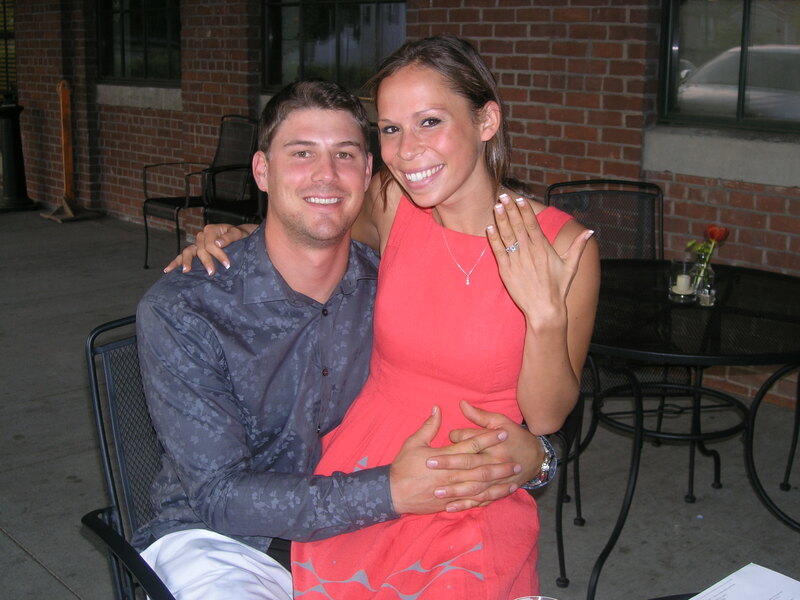 So exciting….we already feel like you’re part of our family Jamie! Congratulation to the both of you! Ok, it’s seeing it all written down that makes it read like a romance novel. Congratulations to my baby girl and her very special boy. Welcome to our family! Love you both. Congratulations to you both from a very happy host mom! He sure has set the bar high for those other 9 off days he gets this season!!! We will get to Pawtucket as soon as school is over to get a look at the rock!